Small garden fish ponds are prone to algae outbreaks during the spring and summer months when sunlight and excess fish waste combine to provide the ideal conditions for algae spores to flourish. If left unchecked, algae clogs filters and chokes pond plants quickly, but commercial pond treatments containing extract of barley straw can prevent and cure algae problems. Raw barley straw bales can maintain water chemistry in spring, and liquid or powdered barley straw preparations kill algae safely, without harming fish or plants. Dredge loose algae with a net or pond rake and manually remove any clumps at the water's surface by hand. Pull out as much material as possible before you start treatment, and there will be less decaying algae to pollute your pond during the treatment process. Choose a pond treatment with barley straw as its active ingredient. Liquids, powders and small bales of raw barley straw prevent algae equally well, but have different dispersal times. All three methods are safe for use with fish. Place a barley straw bale or bundle under a pond rock and the active natural chemicals will leech into the pond water over several weeks. This raw form of barley straw begins to work when you see the straw breaking down and decomposing. It is slower than other forms of commercial treatment, so if you need a quick fix, consider a concentrated liquid solution or powder. Calculate the volume of your pond for the most effective result. It is vital to administer chemical treatments accurately, so use an online pond volume calculator if you are unsure how much water is in your pond. Fill a watering can with pond water and add the barley straw solution according to the manufacturer's recommended dosage. Stir it thoroughly and pour it evenly over the pond’s entire surface area. Mix powdered barley straw compound in a watering can, if you decide to use a powder instead of a liquid. You can sprinkle some brands straight into your pond, so read the instructions carefully for the correct dispersal method. Stir the mixture vigorously ensuring undissolved powder does not sink to the bottom of the watering can. Add the solution to the pond, covering the whole surface area. Remaining granules will break down safely in the pond. Monitor your pond for decomposing material and net out clumps of dead algae immediately. The algae’s rich green colorization will fade to a dull brown as it is starved of nutrients, and the decaying matter floats to the surface or sinks to the bottom of the pond. Prevent a recurrence by starting an algae treatment regimen in the spring to stop spores from developing and taking over your pond during the summer months. Although algae lies dormant in winter, spores grow as soon as there is an abundance of sunshine and sufficient nutrients in the water. 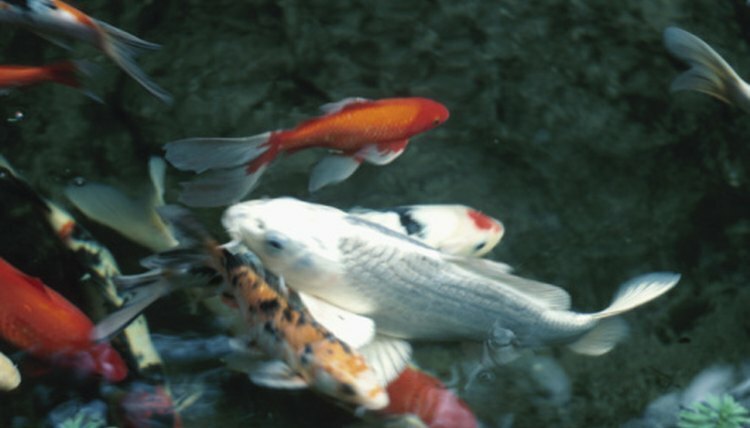 What Type of Equipment Do You Need to Maintain a Koi Pond?